If you desire to add solar electric panels or solar water heating to your home, our beautiful and reinforced foam plank patio cover panels are the most affordable way to add to your patio 's beauty and functionality while giving your solar contractor an easy delivery mechanism to attach panels to. Under the patio cover you will have shade, heaters, lighting, and comfort; and on top money and energy saving solar panels! 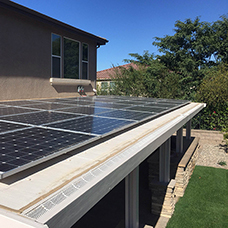 All-Pro Remodeling can design, engineer, and permit the structure for attachment by the solar installer. Just call us and we will get your project started!